Xbox One is the successor to Xbox 360 and quite a competitor of Sony’s PS4 (PlayStation4). It is not only one of the giant game consoles greatly favored by game lovers, but also a multimedia device for video playback, Blu-ray playback, network feature, etc. Xbox One generates a Blu-ray drive for playing Blu-ray more conveniently. But like a Blu-ray player, Xbox One is also under region restrictions. Besides, the Blu-ray disc will be scratched or damaged due to repeat use. Here we introduce how to rip Blu-ray to Sony Xbox One with Pavtube BDMagic, a fast Windows-based Blu-ray to Xbox One ripper which also has a Mac version. It can convert Blu-ray to Xbox One supported MP4/MKV format in order to prevent your previous Blu-rays from damages and play Blu-ray on Xbox One freely. It is a commercial program, but you can free download the trial version first to test whether it is favored by you. First, insert your Blu-rays into Blu-ray Drive, and then drag the Blu-ray files to the program; Or you can get to “File” Menu, click “Load Blu-ray” to draw into Blu-ray movies you want to rip. Blu-ray folder and ISO image files are supported as well. Click on the drop down menu of the Format, select “H.264 HD Video(*.mp4)” or “MKV HD Video (*.mkv)” from “HD Video”. You can also choose “Zune/Xbox 360 Device > Xbox 360 Video(640*480)(*.wmv)” as the target format. It fits on Xbox One as well. After all necessary settings, you can just click the “Convert” button to start converting your Blu-ray movies to Xbox One. After the conversion, click Open to get the output files for your Xbox. From now on, enjoy movie with your family! 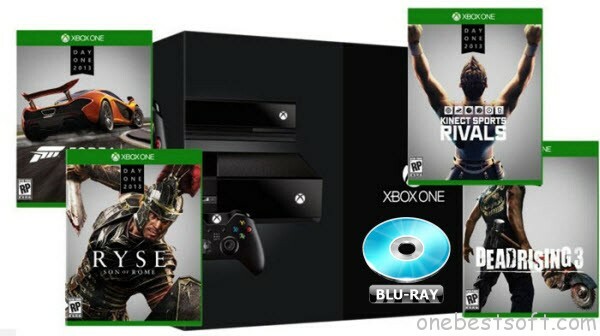 In one word, this Blu-ray to Xbox One Ripper can the Blu-ray to Xbox One conversion in a few clicks for using Blu-ray in Xbox One easily. Plus, it supports ripping Blu-ray movies to play on iPhone, iPad, iPod, Android, mobile phones, pads, PSP, Smart TV, Wii and so on. For watching all your movies on Xbox One, read Xbox One Column. Solved - Can Xbox One S 2TB Play FLV files? AVI to Xbox 360- How to Play AVI on Xbox 360? Can Xbox 360 read MP4? How to Play MP4 on Xbox 360?